I watched week one of the NFL season at Blondies at Planet Hollywood. This is my favorite non-sportsbook to watch football. Prices are relatively cheap and there are plenty of TV’s for the games. Sunday we found false advertising at the table at Blondies. 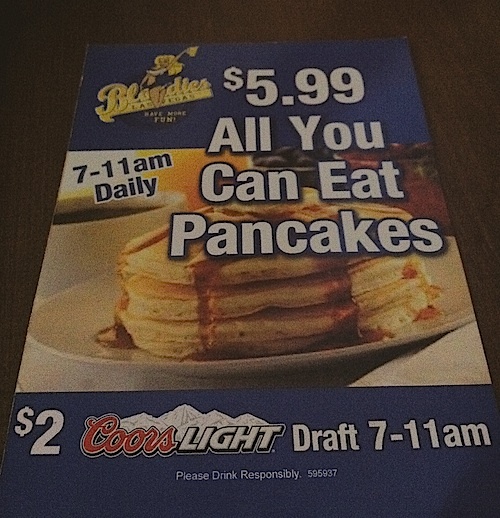 The daily special above for unlimited pancakes & $2 beer sitting on our (and every) table is not available on the weekend. My friend was going to load up on $2 beers, but I told him to ask if it’s available before going crazy. See, in Las Vegas daily (somehow) doesn’t always mean every day. He asked about the $2 beer special and was told that it’s not available Saturday or Sunday. I asked about the $6 all you can eat pancake special. She said it was the same. Of course specials like this on the strip for an NFL Sunday were too good to be true. If I know Las Vegas, Blondies will keep these tabletop promotions up for the NFL season. Consider this your heads up. Despite this, I still think that Blondies is the best place on the strip to watch the games that isn’t a sportsbook. Note: I wrote about Flavor Flav’s Fried Chicken at Blondies yesterday at Vegas Chatter. As I mentioned last week, Rehan Choudhry leaving Cosmopolitan may be a sign that things were changing. Changes continue as Cosmo announced that they’re opening a sport bar. The EA sports bar (yes, named/branded after the video game company) will open around the release of of Madden 2012. The new 25,000-square-foot venue, which will hold as many as 125 guests, is born from a partnership among the Cosmopolitan, EA Sports, PlayStation and Sharp. It will feature Sony PlayStation 3 consoles, a selection of EA Sports games such as Madden NFL 12, FIFA 12 and golf against Tiger Woods, and six high-definition televisions to broadcast daily sporting events. The sports-bar-meets-lounge is designed to have an intimate “living room” feel with nine seating vignettes featuring leather chairs and sofas, as well as an antique foosball table. It will serve bottled beers and snack food and include a retail area selling clothing, gifts and video games. Madden is the only video game I’ve purchased religiously for Xbox or Playstation in the past 10 years. I love it. Madden may be popular, but sports and sports video games are not cool or hip. They never have been. I’m a sports guy and welcome a sports bar, but I can’t see the hipster shunning his fancy mixology cocktail at Vesper and joining the bros/dudes for a Bud Light at the EA sports bar (or lounge). Something’s gotta give. EA branding aside, this likely means the end of Book & Stage as we know it. Book & Stage has never has been much of a sportsbook or place to watch sports. This was the case even before the Cantor Gaming sportsbook opened last year. It’s a great place to watch a small band. I just hope they don’t replace the free national touring bands with bad classic rock tribute bands. Look for “STAGE” to open later this year. Maybe they’ll rename it “pLace” with a hat tip to Stiffs & Georges and “Family Guy“. Things are changing at Cosmopolitan. Bro. Who doesn’t want to celebrate National Bikini Day? National Bikini Day is July 5th. Every bar under the sun will have some kind of specials, since it’s July 4th weekend. Tweet @ me if you want some tips in Vegas, otherwise you can just hit most bar websites.